Ahab is forever Ahab, man. This whole act’s immutably decreed. ‘Twas rehearsed by thee and me billion years before this ocean rolled. Fool! I am the Fates’ lieutenant; I act under orders. The greatest evil is not now done in those sordid ‘dens of crime’ that Dickens loved to paint…But it is conceived and ordered (moved, seconded, carried, and minuted) in clean, carpeted, warmed, and well-lighted offices, by quiet men with white collars and cut fingernails and smooth-shaven cheeks who do not need to raise their voice. American history can only accurately be described as the story of demonic possession, however you choose to understand that phrase. Maybe radical “evil” will suffice. But right from the start the American colonizers were involved in massive killing because they considered themselves divinely blessed and guided, a chosen people whose mission would come to be called “manifest destiny.” Nothing stood in the way of this divine calling, which involved the need to enslave and kill millions and millions of innocent people that continues down to today. “Others” have always been expendable since they have stood in the way of the imperial march ordained by the American god. This includes all the wars waged based on lies and false flag operations. It is not a secret, although most Americans, if they are aware of it, prefer to see it as a series of aberrations carried out by “bad apples.” Or something from the past. Our best writers and prophets have told us the truth: Thoreau, Twain, William James, MLK, Fr. Daniel Berrigan, et al. : we are a nation of killers of the innocent. We are conscienceless. We are brutal. We are in the grip of evil forces. The English writer D. H. Lawrence said it perfectly in 1923, “The American soul is hard, isolate, stoic and a killer. It has never yet melted.” It still hasn’t. 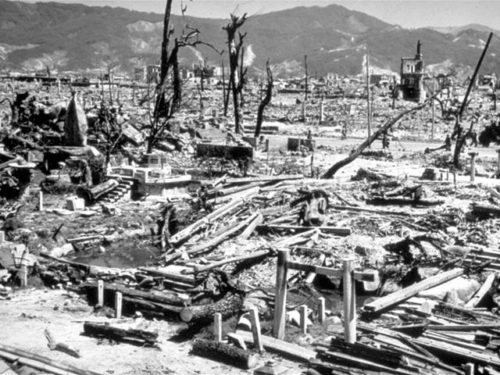 When on August 6 and 9, 1945 the United States killed 200-300 thousand innocent Japanese civilians with atomic bombs in Hiroshima and Nagasaki, they did so intentionally. It was an act of sinister state terrorism, unprecedented by the nature of the weapons but not by the slaughter. The American terror bombings of Japanese cities that preceded the atomic bombings of Hiroshima and Nagasaki – led by the infamous Major General Curtis LeMay – were also intentionally aimed at Japanese civilians and killed hundreds of thousands of them. Is there an American artist’s painting of Tokyo destroyed by the firebombing to go next to Picasso’s Guernica, where estimates of the dead range between 800 and 1,600? 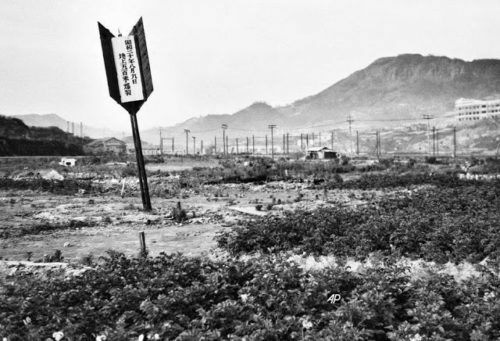 In Tokyo alone more than 100,000 Japanese civilians were burnt to death by cluster bombs of napalm. All this killing was intentional. I repeat: Intentional. Is that not radical evil? Demonic? Only five Japanese cities were spared such bombing. The atomic bombings were an intentional holocaust, not to end the war, as the historical record amply demonstrates, but to send a message to the Soviet Union that we could do to them what we did to the residents of Japan. President Truman made certain that the Japanese willingness to surrender in May 1945 was made unacceptable because he and his Secretary-of-State James Byrnes wanted to use the atomic bombs – “as quickly as possible to ‘show results’” in Byrnes’ words – to send a message to the Soviet Union. So “the Good War” was ended in the Pacific with the “good guys” killing hundreds of thousands Japanese civilians to make a point to the “bad guys,” who have been demonized ever since. Russia phobia is nothing new. Satan always wears the other’s face. Many Baby Boomers like to say they grew up with the bomb. They are lucky. They grew up. They got to be scared. They got to hide under their desks and wax nostalgic about it. Do you remember dog tags? Those 1950s and 1960s? The scary movies? The children of Hiroshima and Nagasaki who died under our bombs on August 6 and 9, 1945 didn’t get to grow up. They couldn’t hide. They just went under. To be accurate: we put them under. Or they were left to smolder for decades in pain and then die. But that it was necessary to save American lives is the lie. It’s always about American lives, as if the owners of the country actually cared about them. But to tender hearts and innocent minds, it’s a magic incantation. Poor us! Perhaps you think I am cynical. But understanding true evil is not child’s play. It seems beyond the grasp of most Americans who need their illusions. Evil is real. There is simply no way to understand the savage nature of American history without seeing its demonic nature. How else can we redeem ourselves at this late date, possessed as we are by delusions of our own God-blessed goodness? But average Americans play at innocence. They excite themselves at the thought that with the next election the nation will be “restored” to the right course. Of course, there never was a right course, unless might makes right, which has always been the way of America’s rulers. Today Trump is viewed by so many as an aberration. He is far from it. He’s straight out of a Twain short story. He’s Vaudeville. He’s Melville’s confidence man. He’s us. Did it ever occur to those who are fixated on him that if those who own and run the country wanted him gone, he’d be gone in an instant? He can tweet and tweet idiotically, endlessly send out messages that he will contradict the next day, but as long as he protects the super-rich, accepts Israel’s control of him, and allows the CIA-military-industrial complex to do its world-wide killing and looting of the treasury, he will be allowed to entertain and excite the public – to get them worked up in a lather in pseudo-debates. And to make this more entertaining, he will be opposed by the “sane” Democratic opposition, whose intentions are as benign as an assassin’s smile. Look back as far as you can to past U.S. presidents, the figureheads who “act under orders” (whose orders? ), as did Ahab in his lust to kill the “evil” great white whale, and what do you see? You see servile killers in the grip of a sinister power. You see hyenas with polished faces. You see pasteboard masks. On the one occasion when one of these presidents dared to follow his conscience and rejected the devil’s pact that is the presidency’s killer-in-chief role, he – JFK – had his brains blown out in public view. An evil empire thrives on shedding blood, and it enforces its will through demonic messages. Resist and there will be blood on the streets, blood on the tracks, blood in your face. Despite this, President Kennedy’s witness, his turn from cold warrior to an apostle of peace, remains to inspire a ray of hope in these dark days. As recounted by James Douglass in his masterful JFK and the Unspeakable, Kennedy agreed to a meeting in May 1962 with a group of Quakers who had been demonstrating outside the While House for total disarmament. They urged him to move in that direction. Kennedy was sympathetic to their position. He said he wished it were easy to do so from the top down, but that he was being pressured by the Pentagon and others to never do that, although he had given a speech urging “a peace race” together with the Soviet Union. He told the Quakers it would have to come from below. According to the Quakers, JFK listened intently to their points, and before they left said with a smile, “You believe in redemption, don’t you?” Soon Kennedy was shaken to his core by the Cuban missile crisis when the world teetered on the brink of extinction and his insane military and “intelligence” advisers urged him to wage a nuclear war. Not long after, he took a sharp top-down turn toward peace despite their fierce opposition, a turn so dramatic over the next year that it led to his martyrdom. And he knew it would. He knew it would. It is a frightening thought that man also has a shadow side to him, consisting not just of little weaknesses – and foibles, but of a positively demonic dynamism. The individual seldom knows anything of this; to him, as an individual, it is incredible that he should ever in any circumstances go beyond himself. But let these harmless creatures form a mass, and there emerges a raging monster; and each individual is only one tiny cell in the monster’s body, so that for better or worse he must accompany it on its bloody rampages and even assist it to the utmost. Having a dark suspicion of these grim possibilities, man turns a blind eye to the shadow-side of human nature. Blindly he strives against the salutary dogma of original sin, which is yet so prodigiously true. Yes, he even hesitates to admit the conflict of which he is so painfully aware. How can one describe men who would intentionally slaughter so many innocent people? American history is rife with such examples up to the present day. Iraq, Afghanistan, Libya, Syria, etc. – the list is very long. Savage wars carried out by men and women who own and run the country, and who try to buy the souls of regular people to join them in their pact with the devil, to acquiesce to their ongoing wicked deeds. Such monstrous evil was never more evident than on August 6 and 9, 1945. Unless we enter into deep contemplation of the evil that was released into the world with those bombings of Hiroshima and Nagasaki, we are lost in a living hell without escape. And we will pay. Nemesis always demands retribution. We have gradually been accepting rule by those for whom the killing of innocents is child’s play, and we have been masquerading as innocent and good children for whom the truth is too much to bear. “Indeed, the safest road to Hell is the gradual one,” Screwtape the devil tells his nephew, Wormwood, a devil in training, “the gentle slope, soft underfoot, without sudden turnings, without milestones, without signposts.” That’s the road we’ve been traveling. The projection of evil onto others works only so long. We must reclaim our shadows and withdraw our projections. Only the fate of the world depends on it. This article was posted on Monday, August 6th, 2018 at 1:51pm and is filed under CIA, Crimes against Humanity, Donald Trump, Espionage/"Intelligence", False Flag, Fascism, Hiroshima, Japan, John F. Kennedy, Massacres, Militarism, Nagasaki, Nukes, United States, US Lies, US Terrorism, Violence, War Crimes, War Industry.